Hate is the anger of the weak. Thus, hate thrives on the weak. Before the dark times, humans would gather in major cities around the world. In the largest, populations would soar to an excess of 20 million. You could get lost in a sea of people, just another anonymous figure walking down the street. When the world ended, the cities were the first to fall. Massive numbers of people were wiped out in the blink of an eye. Those who survived were scattered and lost. For generations, humans had to adapt to a nomadic lifestyle, never stopping in one place for too long. Threats would always drive them forward; either a lack of food, or something much more dangerous that threatened to crush their skulls and bathe in their blood. Eventually, people started to settle again. They formed small groups of trustworthy allies, and societies, of a sort, began again. These new groups of people lived in Villages. Safe enough to defend against some outside threats, but small enough that they could be left behind, should the threats ever prove too large. In HATE, the Village is an important location, where a Tribe can recuperate and heal between battles, and feast of the flesh of fallen enemies. But even during the conflict, players will have to manage their home base and keep the fires of the Forge burning if they hope to come out on top. A Tribe’s Village is made up of different buildings, each of which are helpful in the development of the Tribe’s members. These Villages are more than simply a gathering of homes. They are training grounds, a communal kitchen and dining hall, and a spiritual center. They are a home to the Tribe, but being taken back to an opponent’s Village promises that your last hours are spent in terror and pain. A player’s Forge factors heavily into battles. During the game, players can use Savagery tokens in the Forge to unlock special abilities that will help unleash a berserker rage on the battlefield. While the effects are not permanent, it might be the push a Tribe needs to come out of a conflict on top. At the end of each savage encounter, the Forge is cleared. But a Tribe is an evolving life force, and certain buildings in their Village continue to contribute to their long-term development. The Training Grounds is a place where Tribe members can hone their skills, turning them into more effective killing machines. Here, players can select new abilities to permanently attach to their characters, at least for as long as they’re alive. Each Tribe member has slots for four different skills. As they grow and develop over the course of a Chronicle, they become complete characters. Players shape them in the most useful and deadly way to mete out a bloody punishment to those that would oppose them. When they fall in battle, it’s like the loss of a family member. The Shaman’s Hut is a place of sacrifice to the gods and mysticism. It allows players to have more control over the flow of the cards from the Tribe deck. Over the course of numerous bloody encounters, Tribe members are going to become scarred from the war. It’s inevitable that their eyes might be gouged out, limbs cut off, or skulls cracked. As characters receive scars, they are unable to develop their skills completely. Although their technology is crude, each Village has its own doctor that can offer their medical expertise. Players can visit the Chiurgeon to remove scars from their Tribe members. Inspiring warriors to put their life on the line isn’t always an easy task. Engaging in battle means a good chance they will die, and a certainty they will see what the insides of a human look like. They need to feel as if they’re fighting for something bigger than just themselves. The Hall of Heroes gets filled with the stories of breathtaking victories and glorious deaths. It not only helps with Tribe members, it can inspire Mercenaries to join a player’s Tribe and fight on their side. Mercenaries replace a standard Tribe member and come with unique skills already in place. Although Villages play important roles during the heat of battle, they also promise a bloody fate for captured opponents. After each battle in HATE, players retreat to their Village. Here, they are able to lick their wounds and enjoy the spoils of war. If a player has managed to drag an opponent’s KO’d character off the battlefield, their horrible fate is decided in the Village. One thing is for sure, they will soon experience a pain no human deserves. The captured are either destined for the Oven, where they are converted into resources for the Tribe, or the Torture Pit. When an enemy Tribe member enters the Torture Pit, they become Hate (one of the currencies in the game). In either event, the character is lost forever, and their Tribe will need to start a new one from scratch. Suffice to say, players would be wise to protect the bodies of their fallen comrades on the battlefield. The Villages in HATE are a home for a Tribe, but no location in this new world is free from violence or cruelty. Players will grow the skills, abilities, and resources of their Tribe in their Village, but it’s a dark day for those that are dragged back to an opponent’s home. Their last moments will only be filled with pain. HATE is coming to Kickstarter January 16 at 3PM EST. 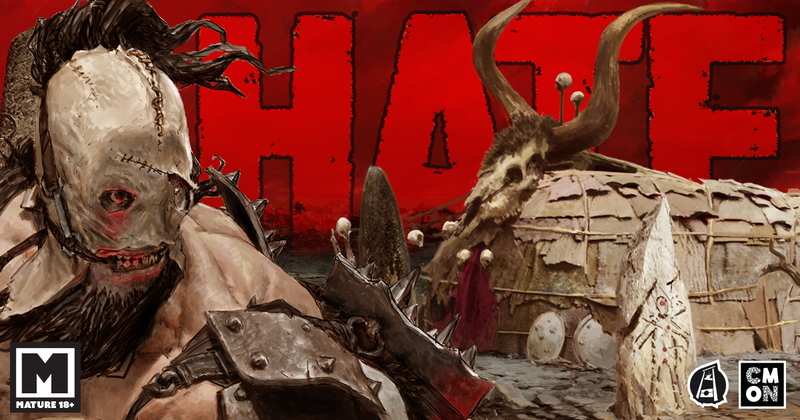 Follow the HATE Facebook page for regular updates, including art, miniatures, and articles. Read the HATE overview here. Read about the Um'Gra Tribe here.